Members of the National Union of Journalists have laid a wreath at the door of a newspaper office which was closed by Trinity Mirror last week. Staffordshire-based free weekly newspaper the Cannock Chase Post went to the press for the final time after the publisher announced its closure last Monday. The closure came as part of a series of cutbacks across Trinity Mirror Midlands which will see 45 editorial jobs axed, along with the creation of a regional production hub and features unit. The Stafford Post and Sutton Coldfield News were also closed as part of the restructure. 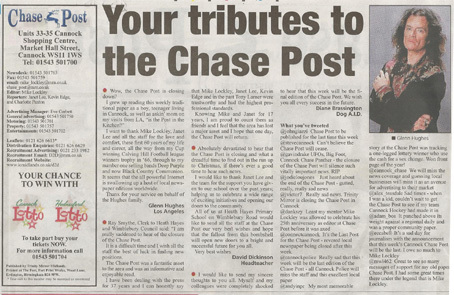 The last edition of the Chase Post included six pages of tributes from local members of the community, including local MPs, councillors, police chiefs, and even one from former Deep Purple guitarist Glenn Hughes. Editor Mike Lockley, who recently celebrated 25 years in the chair, wrote: “It’s an incredibly sad day and there will be a tear when the last page of the very last edition is sent to the print works. “I’d like to thanks the community for its support and kind words. I have spent the last few days fielding calls and responding to emails from readers genuinely shocked and upset. “We set out from the start to be the voice of this community. Judging by your kind words, we’ve succeeded. The wreath was delivered by the NUJ’s Midlands and Northern organiser Chris Morley and included the message ‘Chase Post, Sutton News & Stafford Post R.I.P under Trinity Mirror’. Said Chris: “Although we have laid this wreath, the NUJ does not believe these papers have to die. Trinity Mirror claims to have searched for a buyer, but has not been open about its efforts. “It has an obligation by law to try to eliminate or reduce the number of redundancies the closure of these titles will bring about and one obvious way of doing that would be to actively seek a buyer. Last week Trinity Mirror bosses said they had already tried and failed to sell the titles. The company did not wish to comment further. The newspaper’s last edition went to press last week though the website is still live. In the last round of ABC figures the Chase Post had a circulation of 48,716. Don’t miss Steve Dyson’s blog on Wednesday for a review of the final two editions of the Post. 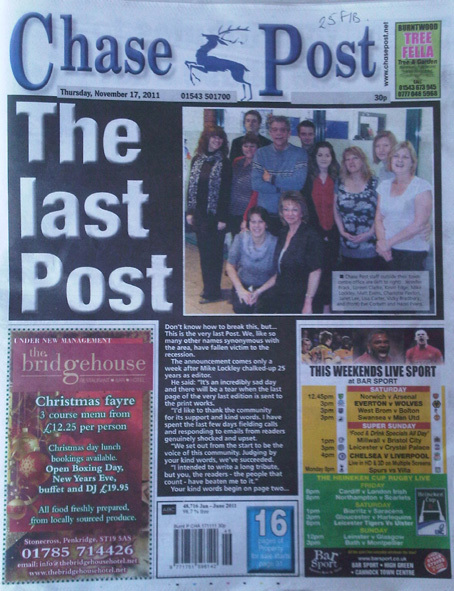 Readers including rock star Glenn Hughes pay their tributes to the Chase Post in its final edition. I am an avid ‘paper watcher’ and can only comment that in my area (anon) I have seen a dreadful fall in standards of the newspapers. The mistakes in my local paper have been unbelievable and the subbing has been awful. I did some investigation and found that subbing was not even done in this town and consequently terrible mistakes were made for instance in the spelling of village names and captions on photos had to be seen to be believed. Headlines have had mixed tenses. One photo caption read ‘The car of her and her partner which was in the accident’. I have done freelance writing in the past hence my interest in local press. Newspapers shot themselves in the foot because they allowed their content on the web without any charge. Some of the websites are also badly laid out and hidebound with pop ups and adverts. I now read the Daily Telegraph and frankly, I feel that some of these papers should be laid to rrest. It is a blessed release for some of them. Like many others I am so, so sad about the Chase Post in particular. I was deputy editor of the nearby Tamworth Herald for 22 years – I spent 33 years there from trainee – before being made redundant in 1998 after it was first taken over by Adscene, who made the directors and middle managers redundant over two years and then sold it to Northcliffe for £44m – double what they paid for it. When I ran the newsroom there were 9 reporters and two photographers. Now there are four reporters – two part time. It used to be one of the best paid-for weeklies in the country and won awards. But I digress. Mike Lockley has a brilliant reputation in the Midlands as a dedicated digger of the old school and the fact that he himself covered two parish councils a week does not at all surprise me. Anyone who doesn’t take him on is a total fool. So sorry, Mike. Good to see HTFP spelling Coldfield correctly, which is more than the NUJ could on their press release on their website. The last two editions of the Chase Post are reviewed in ‘Dyson at Large on Htfp tomorrow, Wed Nov 23. This blog will include detailed points from top Trinity Mirror sources on the reasons behind the closure.